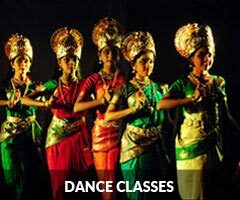 Classes | Shree Mookambika Cultural Academy Reg. SMCA aims in propagating Indian classical Dance and Music. Though basically started for training of Classical dance,i.e., Bharatanatyam , it also teaches folk dances and semi classical dances along with main course. Karnatic Classical Music is also another art form which is taught in many branches along with dance. Devotional songs, light music and folk songs are also being taught on request. On some special occasions like public performances, exams, interviews, special coaching can be taken on request. Those who want individual classes, both on regular and periodic basis can also have by taken prior permission and appointment. SMCA also provides training in another classical dance-Kuchipudi as a special course for the interested on getting the prior permission. Similarly, SMCA conducts various kinds of workshops on different aspects , both theory and practical, and provide the teachings of experts in related sections. For those who wants only theory classes can also get by enquiring in the Academy. For different sections of theory courses, experts and research persons of different Universities are handling the classes. Along with regular classes, SMCA trains the students to appear for different examinations conducted by Karnataka Secondary Education Board like Junior, Senior, Pre-Vidwat and Post-Vidwat exams every year both in Bharathanatyam and Karnatic Music. Moreover training for State and Central Government is also provided and many students are the beneficiaries.